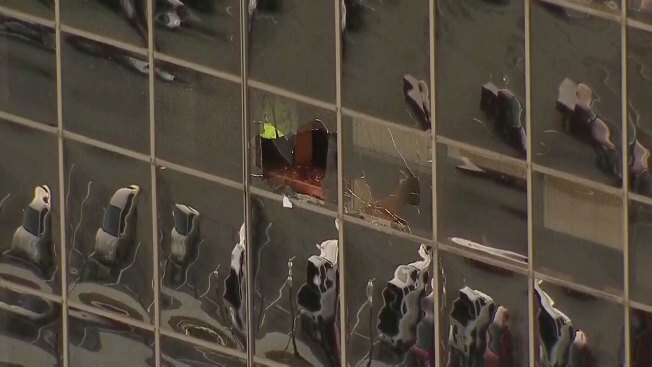 At least two windows on the 17th floor of a downtown Fort Worth skyscraper shattered Tuesday morning, sending broken glass and debris to the ground below, firefighters say. Strong winds blew an unsecured window-washing scaffold cable into the side of the Wells Fargo Tower, a Fort Worth fire spokesman said. NBC 5 Meteorologist Grant Johnston said 35 mph winds were recorded in downtown Fort Worth at the time. Video from Texas Sky Ranger showed at least two broken windows on the building's east side. Commerce Street and East 1st Street remain closed around the building when we checked at 4:30 p.m. Monday afternoon as the glass is replaced.